This powerful work lamp is a perfect addition to any workshop. The long flexible neck allows it to be positioned to illuminate even the most hard-to-reach areas and get rid of troublesome shadows, giving a clear view of the work in progress. To further increase the lamp’s flexibility, a sliding collar on the lamp head allows either a spotlight or floodlight beam to be created. The strong magnetic base and magnetic side clip mean the light can be secured virtually anywhere on a machine. It can be powered by standard AA batteries, a rechargeable lithium battery or directly from the mains via the USB cable (using a 5 V, 1 A USB plug adaptor). 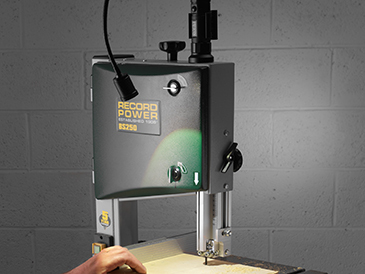 This lamp gives hours of uninterrupted use and is ideal for a wide variety of machines such as scroll saws, bandsaws, sharpening machines, lathes and many more.